Illogical and quite unapologetic at that, Sanjay Ghadvi follows up his 2004 surprise hit “Dhoom” with a much bigger, equally entertaining sequel that is bound to match its predecessor’s success, if not better it. Throw in some bikes, jet skis, chases, exploding choppers, insanely beautiful women in bikinis, mix it up with a touch of humor and romance in a script stripped of all intelligence and Dhoom machale once again as A.C.P. Jai Dixit sets out to capture “the perfect thief”. A theft artist with a fixation for priceless curios, Aryan (Hrithik Roshan) is wanted for exquisite heists around the world. Based on intentional hints left behind on each robbery, Dixit plots a pattern, predicting Aryan’s next heist in Mumbai. A master of disguise a la Val Kilmer from “The Saint”, Aryan escapes with Dixit and Ali (Uday Chopra) on his trail. Along the way, he finds a partner in Sunerhi (Aishwarya Rai), Dixit’s mole, posing as a talented thief. Dixit and Aryan enter a cat and mouse game with Sunehri stuck in between, with the beaches and carnivals of Rio de Janeiro playing perfect host. Devoid of a strong plot, the script and its treatment also suffer from a few loopholes that are almost intolerable even for a straight up masala film. It seems odd that Ghadvi expects his audience to believe that his characters may not recognize Hrithik Roshan with a slender, brown moustache and goatie with long hair, or, for that matter, with curly hair and a freckled face. Additionally, after presenting Jai Dixit as the smartest cop around, it seems strange that even after Sunehri meets Aryan, Dixit doesn’t bother calling in a sketch artist to draw up a comp of this thief who has literally stolen his sleep. Instead, he prefers guesswork, following Sunehri to Brazil, and barks at her for not doing her job. 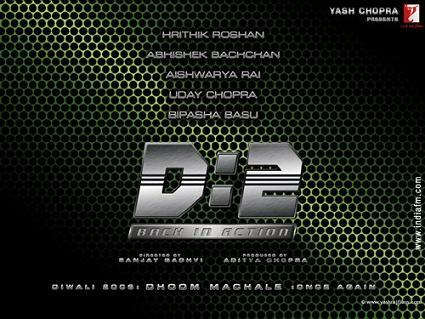 Yet, “Dhoom 2” entertains thanks to Ghadvi and Allan Amin’s ambitious action sequences, capably performed by Hrithik Roshan, the pillar of “Dhoom 2’s” strength. In a physically demanding role, Roshan displays a range of emotions, humanizing Aryan, while effectively carrying off his various disguises, doing full justice to the hard work put in by the make-up department. Abhishek Bachchan once again nonchalantly sleepwalks through his role, although it may be well advised for him to avoid the dance floor in any subsequent films with Roshan. Uday Chopra replays Ali as he did in “Dhoom”, attracting his fair share of laughs along with Bipasha Basu. Ironically, Aishwarya Rai, touted as the film’s star attraction proves to be films biggest blunder! After a stunning introduction and a steamy dance, Ms. Rai opens her mouth to an awful, intolerable performance that gets worse as the film progresses, hitting rock bottom in the film’s only intense and intimate scene. Despite the aforementioned flaws rounded off by amateurish editing, “Dhoom 2” is mindless fun. It is the kind of ridiculous entertainment men especially take a sadistic pleasure in watching. Overlooking the technical flaws and Aishwarya Rai’s painful performance, “Dhoom 2” pumps the adrenaline up fairly well to kill an evening. Is it worth the $8? – Yes. Is it worth standing an hour in line for? – Probably not.